Homeschool planning. Some people love it, some people hate it, some people love to hate it. The bottom line is, if you are homeschooling, you have to deal with homeschool planning. I actually love planning, which means I am the perfect person to give you some advice on how to plan your homeschool. This week we are going to explore a lot of ways that homeschool planning will help your life, and more specifically to get your homeschool in order. 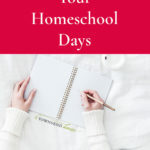 Homeschool planning does not mean that you have to be a school at home family. Far from it. In fact, I do not identify as someone who does “school at home.” I like to think we are eclectic, and if I am being honest, I think most people are. We draw from a lot of different philosophies, unschooling, Charlotte Mason, Thomas Jefferson Leadership, literature based – lots of different ideas! Sign up below to get every post delivered right to your e-mail each day! The easiest way to follow along. There are few times you are going to find someone who is a pure unschooler. They may be unschool-y on some things, and a little more rigid in other things. Even classical education with their amazing co-ops, I’m sure there are other bits of different homeschool philosophies that work into their days. 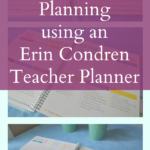 Regardless of which “type” of homeschooler you believe you are, planning is still a must. Just because you are an unschooler does not mean that you don’t plan anything – actually it is probably the opposite. You will spend hours and hours trying to help your child find the resources they need to follow the interests they have. This week we will be exploring different ways in which we can plan our year, our weeks, our days. How do you know if you are “doing enough?” What do you do when that FOMO starts to creep into your psyche – I will give you a hint, block it out! Planning doesn’t have to be difficult, or a punishment. It can be a great way to work through difficult times in your homeschool. Part of planning is to get your kids and yourself into a good rhythm. Create a blueprint that works for your family. But, it also means knowing when to let something go if it isn’t working. That is the struggle for a lot of us, knowing when to let go of “stuff” because so many other people are adamant about how important that “stuff” is. I want this series to be of the most benefit to you, my lovely readers. If you have any questions, please do not hesitate to contact me! 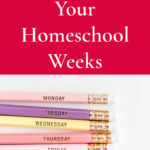 Do you enjoy homeschool planning, or is it the last thing that you would like to do? I LOVE planning! But, as soon as I plan something I see another fantastic idea and I change it. I try not to have FOMO for my kids education but often I do. I fear that if I don’t get that next best curriculum / course then it will cost them an opportunity in University. I have done this since Kindergarten when my parents and inlaws both were not on board and said that only a REAL teacher should homeschool, and keep asking when we are going to let them go to a REAL school. We have been homeschooling for 5 years now and my kids are smart – but I wish I could relax a little more.